This in-depth file reviews some of the major Arab League Summits since the creation of the organization, specifically those that deal with human rights, giving an overview of the discussions, the positions assumed and the decisions adopted. The first Arab League Summit was officially held in Cairo in 1964; earlier of this date, two Arab Summits were held in 1946 and 1958, but they were not part of the Arab League Summits system. As of 2013, the League counts 24 ordinary sessions, the last one being held in March 2013 in Doha, Qatar. Besides, due to the circumstances and events in the Middle East, 10 extraordinary Summits have been also held so far. The Arab Summits bring together periodically the heads of States and Government of the League member States. They discuss for a few days questions from a variety of sectors, such as economy, policy, external relations, and many others. The human rights approach was not distinctive and explicitly mentioned in the official declarations or resolutions of the summits until the beginning of the 90’s. However the Summits dealt even before of this date with questions related to non-proliferation, peace in Middle East and economic and social development, with a specific focus on the fight against poverty. Peace in Middle East. The major subject of discussion of almost all the Summits was the Israeli-Palestinian issue. In this sense, the Arab League has always condemned the violations of human rights against the Palestinian population, and called for the withdrawal of Israel from the occupied territories. In both the extraordinary Summits held in 1988 and 1989 respectively in Algiers (Algeria) and Casablanca (Morocco), the Arab leaders claimed for an international conference for peace in Middle East under the command of the United Nations. In the official communique of the last extraordinary Summit held in October 2000 in Cairo, Egypt, the delegates of the Arab States expressed the need for “the formation of a neutral international investigations committee within the framework of the United Nations, which would submit a report to the Security Council and to the Human Rights Committee on the cause of the deteriorating situations in the occupied Palestinian territories”. In 2001, the Arab leaders present at the Summit in Amman, expressed their “resentment at the use of USA of its veto against a draft resolution at the Security Council on protecting the Palestinian peoples and establishing a UN observer force in these territories". Various meetings also dealt with other specific problems and conflicts in the Middle East, usually addressed in the extraordinary Summits, as the one held in 1970 in Cairo (Egypt) following the events in Jordan between Palestinians and Jordanians. The summit called for immediate end of all military operations between the combatants, requiring the formation of a high committee to monitor the implementation of an agreement that stipulates the release of the detainees of the involved sides in the conflict. The extraordinary Summit held in Riyadh in 1976 was held to discuss the crisis in Lebanon. The Summit asked for a cease-fire on the Lebanese territory and the restoration of peace, and urged the Palestine Liberation Organization (PLO) to respect Lebanon sovereignty and integrity. The summit also addressed the Arab commitment for bringing peace including through media campaigns, aiming at the cessation of hostilities and the development of a spirit of collaboration. Other events in the region addressed by the Arab Summits were: the conflict between Iraq-Iran (Arab Summits held in Amman, Jordan, in 1980 and 1987, and in Casablanca, Morocco, in 1985), Iraq-Kuwait ( Arab summit held in Cairo, Egypt, in August 1990). Non-proliferation. In the Summit held at Casablanca (Morocco) in 1965, the Arab leaders presented plans for non-proliferation of nuclear weapons and their support for the international disarmament, statements that were reiterated many times in successive meetings. During this Summit a pact on solidarity and coexistence among Arab countries was also signed. Economic and social development. A comprehensive 20 –year economic development strategy was approved in 1980 during the Arab Summit held in Amman (Jordan). The initiative aimed at improving infrastructure, scientific research, technology transfer, rural and industrial development. Moreover, the Arab economic strategy gave priority also to the development of human skills and access to education. 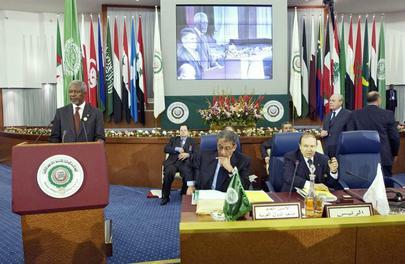 However, from the end of the 90’s, the Arab League Summits begun to put an accent on human rights, reiterating both the importance of human rights in general, and the promotion of specific questions, such as the enhancement of women in the Arab society, the rights of the child, the right to education, the right to non-discrimination and others. The Tunis Declaration was issued during the 16th ordinary Summit, held in 2004, in Tunis, Tunisia. The Declaration reaffirmed the commitment of Arab States “to the humanitarian principles and the noble values of human rights in their comprehensive and interdependent dimensions, to the provisions of the various international conventions and charters and to the Arab Human Rights Charter adopted by the Tunis Summit, as well as to the reinforcement of the freedom of expression, thought and belief and to the guarantee of the independence of the judiciary.” Besides, the Declaration mentioned the increasing role of women in the society, the enlargement of political participation and the development of education. The Algiers Declaration issued at the Arab League Summit conference in 2005 called for setting up a “transitional” Arab Parliament and “an instance monitoring the implementation of decisions”. The Declaration underlined the importance of continuing modernization and development in the Arab world, by promoting the practice of democracy, expanding political participation, strengthening the values of citizenship and the culture of democracy and human rights. In the Declaration, a full paragraph is dedicated to the promotion of equality of women and their increasing role in the society. The 2012 Summit in Baghdad (Iraq) was held without the presence of Syria, suspended in 2011. In the Baghdad Declaration issued at the end of the Summit, the Arab League expressed its support for the “demands for freedom, democracy and peaceful transfer of power for the Syrian people”. The League declares as well its support to Kofi Annan, the UN-Arab League special envoy to Syria.The Summit gives also recommendations to the States as to “emphasize on the respect for human rights and ensure political, cultural, religious rights of minorities”. In the last Arab League Summit to date, held in March 2013 in Doha (Qatar), a number of issues were discussed, including developments in the political and security situation in Syria and Palestine. The Summit welcomed the assumption by the Syrian National Coalition of Syria’s seat in the Arab League, and urged international organizations to provide humanitarian aid to Syrians . The released Doha Declaration from the Summit expresses the will to enhance the status of women in society and calls for passing legislation to guarantee their rights.